A technique for reducing the toxic effects of commercially available cigarettes has been developed by chemists at Johannes Gutenberg University Mainz (JGU). The number of smokers around the world is on the rise despite the fact that the World Health Organization (WHO) estimates that around 6 million people die every year due to tobacco consumption. The number of tobacco-related deaths corresponds to the fatality rate that would occur if a passenger plane were to crash every hour. Based on figures published by the German Federal Statistical Office, the tobacco industry brought about a turnover of around EUR 20.5 billion in 2016 through the sale of cigarettes in Germany alone. Tobacco smoke is made up almost 12,000 different constituents. Among these are narcotoxic substances such as nicotine, carbon monoxide, and blood toxins like cyanide, not to mention the different carcinogens. Among these are free oxygen radicals, also called reactive oxygen species. With every puff on a cigarette more than 10 quadrillion (1016) of these molecules are inhaled. The Mainz-based team led by Professor Wolfgang Tremel has explored how to significantly bring down the levels of these free oxygen radicals and thus markedly reduce the toxicity of cigarette smoke. This development will help make the consumption of tobacco-based products somewhat less dangerous and it could also be extended to other areas in which reactive oxygen radicals are an issue. Researchers obtained the key idea behind the concept from natural enzymes. In the presence of an improved concentration of reactive oxygen species as a result of, for example, enzymatic dysfunction, the inhalation of tobacco smoke or UV radiation, oxidative cell damage and uncontrolled cell division can take place. Nature monitors the concentration of radicals through antioxidant enzymes such as superoxide dismutase (SOD), which plays a vital role in the preventing pathological processes, including cancer growth and tumor, stroke, and inflammatory diseases. Metals such as copper-zinc, iron, nickel, and manganese are utilized by the naturally occurring enzyme as reactive centers that cause oxygen radicals to decompose allowing the organism to be protected from their violent reactive behavior. It is currently possible to develop or isolate enzymes like SOD, but the process is expensive. However, matters are get complicated by their poor stability on exposure to high temperatures and non-physiological pH values. Researchers in the field of biomimetics, with natural enzymes in mind, are exploring ways to imitate natural biological reactions with the help of synthetic compounds. Chemist Karsten Korschelt and food chemist Dr. Carmen Metzger exzmined amino acid-functionalized copper hydroxide nanoparticles as potential synthetic analogues of cupriferous SOD. They discovered that the particles were linked to a higher rate of catalytic activity based on the decomposition of oxygen radicals than the enzyme itself. This is in principle not such a surprise as all copper atoms on the particle surface can have a catalytic effect, yet the enzyme has only one active center. Functionalized copper hydroxide nanoparticles are inexpensive to produce and extremely stable when compared to natural enzymes. Even though it is possible to mimic natural enzymatic reactions with the help of nanoparticles, there are still only a few applications based on the principle. Nanoparticles themselves are used in cosmetics, for example, and as nano sealants in textiles and paints. Individuals are so extensively exposed to free radicals on a daily basis that their presence is repeatedly ignored altogether. However, they represent a major threat to health in cigarette smoke and exhaust fumes. 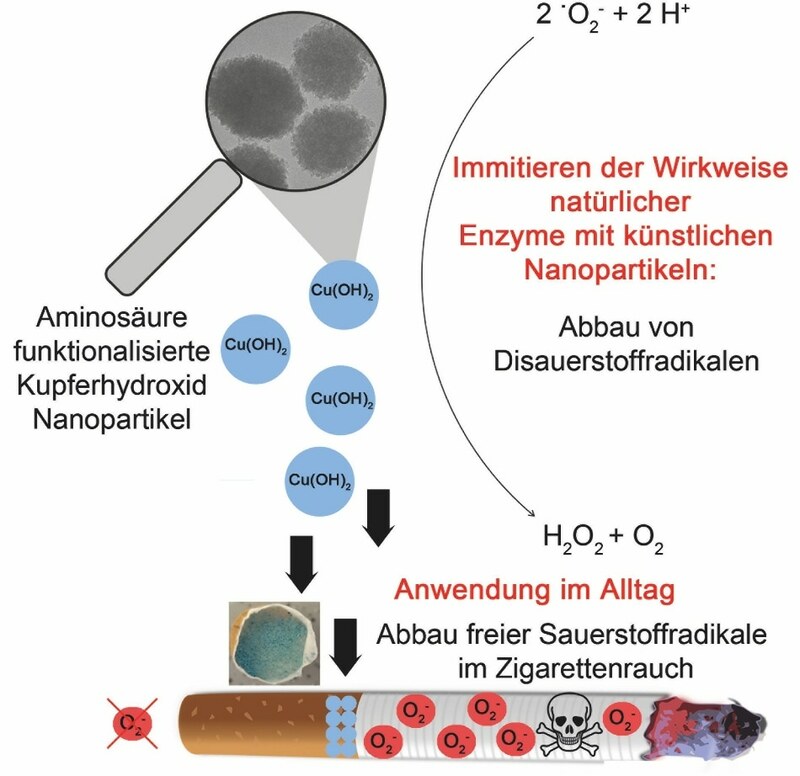 The team of chemists in Mainz is thus partnering with the group led by Professor Jürgen Brieger of the Mainz University Medical Center in order to establish whether it is possible to put together functionalized copper hydroxide nanoparticles in cigarette filters and thus bring down levels of free radicals in smoke, on the whole providing smokers with increased protection against their toxic potential. Cytotoxicity tests have highlighted that the cigarette smoke extracts in the analyzed concentrations no longer have a toxic effect on human cells after passing through cigarette filters comprising of nanoparticles, while there was greater toxicity in the case of controls in which untreated filters were used. This demonstrates the positive effect of the particles when used in cigarette filters and their stability during the smoking process. The researchers in Mainz were thus successful in demonstrating the possibility of imitating natural defense mechanisms by employing nanoparticles and also in reducing the toxic effects of different types of smoke. The employed analyzes and methods were developed and used in collaboration with the University Medical Center of Johannes Gutenberg University Mainz. The scientific journal Nanoscale has published the report on their work.